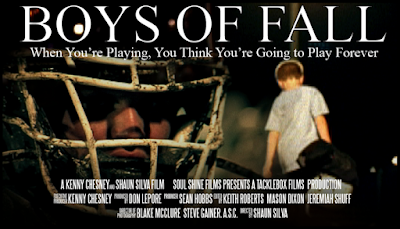 I recently watched a documentary called Boys of Fall. 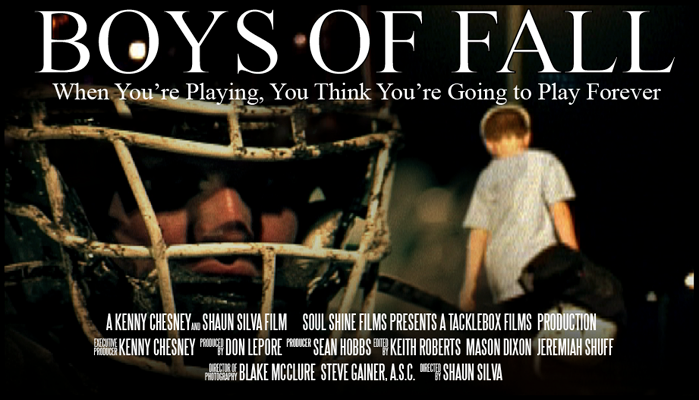 It's a film by Kenny Chesney that explores why high school football is so special to those who played. I loved hearing from guys who had won NFL Super Bowls, but still felt that nothing could compare to the emotions of their high school playing days. Some were great players in high school, others were mediocre. But they all cherished the memories of wearing their school's jersey each Friday and the relationships they formed with their teammates. I also liked the interviews with high school, college and NFL coaches. Each one made it clear that what they cared more about the difference they made in the lives of players than they did about winning football games. Say what you will, but the closest I've come to crying during a movie was the championship game scene in Friday Night Lights. This film brought up some of the same type of feelings. There is something noble about sacrificing and putting everything you have on the line to fulfill a purpose. Being willing to work hard as hard as you can to win when there's no consolation prize. You either win the title game, or you lose. You succeed or you fail. But even if you didn't win, it was still worth trying. You believed that you should pursue something so you did. With passion and determination. You have the peace of mind that comes with having no "what-ifs". I want to be able to say that about my life one day. That's what I think got to me with Friday Night Lights. They worked so hard and overcame so much to get to the championship game, and though they lost, that season held a special place in their hearts. I don't think the fact that they lost lessened the bond they had with their teammates. I'm sure they were still proud of the effort they put forth, even though they didn't get what they ultimately sought after. Each player took a lot away from that season, though a championship was not one of them. I think there is wisdom in embracing the fact that life can be bittersweet. We reap character benefits through making sacrifices and enduring hardships--apart from whether we get the thing we're searching for. Sometimes not getting what we're hoping for, helps us appreciate the fact that we actually learned a lot along the way.